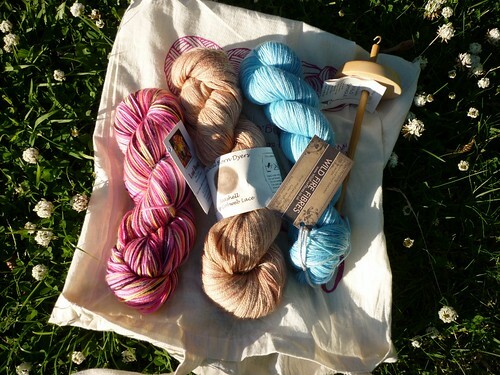 I discovered quite a few dyers that I hadn’t heard of before. All three that are pictured are completely new to me. I had such a hard time picking a color in Wild Fire Fibres’ stall. I eventually settled on Cornflower (Tempo base) and I’ve already cast on with it (Lissajous by Cookie A). The drive there and back was nice and easy. Although on the way there we discovered that the CD player wouldn’t eject the CD. And since there weren’t that many radio stations that didn’t sound static-y, we listened to that one CD over and over again. And then some more. Other than that, it was a fabulous day. I definitely want to go again. Which leads me today. Ryan is up from London so he and O decided to replace the stereo-radio system in the car. We went to Halfords, picked out a new one, then I left the two of them to it. They called in back-up after a few hours: O’s dad (he’s a mechanic). After four hours, it was all sorted out. I don’t have steering wheel controls any more, but now I can answer my phone if it rings while I drive, so it all evens out. Last Sunday we went to a dance competition in Stockport. Ian & I placed 6th in both Beginner’s Ballroom (Waltz & Quickstep) and Beginner’s Latin (Cha & Jive). Even though I was still feeling pretty ill (the coughing fits after each round of dancing), just being able to dance again was worth it. If you really want to see me dance, I’ve uploaded a video of the waltz. I’ve also been kinda promoted. I’ve moved to a new team within Accounts. My very first job was being a cashier at a supermarket, now I’m a Legal Cashier. Funny how that works. This was decided on Monday, started training on Tuesday. Which meant that we played musical desks again. I now sit where WorkJane used to sit. WorkJane sits at Lesley’s desk and Lesley moved to a completely different table in Purchase Ledger. And WorkJane doesn’t know about the move yet. She’ll be in for a surprise on Monday when she comes in from her holiday. Fun times. So far, I really like my new job. It’s scary since I am dealing with massive amounts of money and actually dealing with banks instead of just inputting the information into the accounting system. But it’s new and fun. It’s a nice change from what I used to do. And I really like most of the people in that team. Let’s see, what else… I’ve finally finished spinning the Tea & Roses shipment. It was all done before Woolfest, which meant that I could purchase a new spindle. I’ve got 601 yds/98g of pretty laceweight to play with now. I mentioned that I’ve cast on the Lissajous. Oh! Bashful Butterflies update: only need to measure the small version’s dimensions, add photos to the pattern (which I’ll be taking this weekend when I can use my sisters as models), and then it’s done. My three testers have been fabulous and I hope they’ll volunteer to test for me again. They’ve caught my autocorrect errors, helped me re-phrase things in a clearer way, basically just been wonderful.